The majority of dental insurance plans have an annual maximum per person that expires at the end of the calendar year. If you don’t use up your benefits by December 31, you forfeit the remainder of that maximum! Even some flexible spending accounts (FSAs) expire at the end of the year; if you don’t use up what is in the account before the deadline, you could lose those funds altogether. Don’t let your benefits go to waste! Get in touch with our administrative staff to check how much of your annual maximum is still available for use. If there is enough for you to get a bit of dental work done, schedule an appointment today so you can get any necessary procedures underway (or perhaps completed) by the end of the year. Contact us soon — our fall schedule is filling up quickly. You pay for your dental insurance premium throughout the year. Most plans provide $1,000 - $1,500 worth of coverage; some plans offer even more. If you don’t take advantage of those funds by December 31, any benefits you still have remaining disappear forever. Essentially, it’s a “use it or lose it” situation. 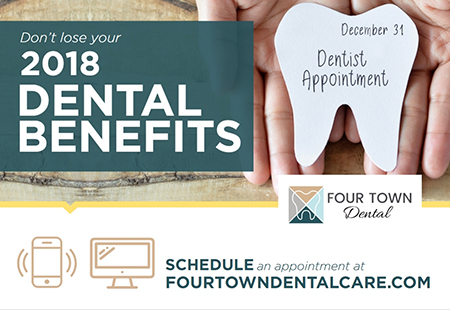 It’s wise to schedule an appointment now in order to maximize your 2018 dental benefits since many treatments take place across several appointments. We’re happy to help you understand your coverage and use it in a way that minimizes your out-of-pocket costs. FSA funds may not roll over to the following year. If you or your employer has placed money in an FSA throughout 2018, you can use those dollars to care for your smile. Don’t let your hard-earned money go to waste. It may save you some money if you have a cleaning, exam, and set of X-rays completed before the end of 2018. Although many plans cover these services at 100%, their cost likely still counts toward your yearly maximum. Schedule your preventive services this year so you’ll have your entire annual maximum available in 2019 to help you pay for any necessary advanced treatment. Some plans have a “rollover period” that might allow you to use 2018’s remaining benefits in 2019. However, it is typically a reduced amount that gets carried over. You’ll still lose the opportunity to truly maximize your benefits. The cost of healthcare is a significant concern for most families. Schedule an appointment today to maximize your 2018 dental benefits and keep your out of pocket costs as low as possible. Take a look at your FSA or healthcare savings account (HSA) and plan to use your remaining funds to get any needed dental work taken care of. The end of the year will be here before you know it, so book now and let us help you get the most out of your dental benefits. Contact us to speak with a member of our office staff so we can verify your insurance, confirm any remaining benefits, and find a convenient appointment time for you.